Wimbledon, Day 11 — Roger Federer keeps on cook’n. The Swiss essentially destroyed Milos Raonic 6-4 6-2 7-6(4). Going into the match, Raonic thought he could beat him into his own game, but Federer out-thought him; he was so precise, his serve was excellent, he could mix it around or hammer it. Spin, slice, drop shots, essentially, anything he wanted to. Once again, the 36-year-old Federer is already the clear favorite to win Wimbledon. If he wins on Sunday, he will have 19 Grand Slams. That is beyond phenomenal. Raonic, who reached the final last year at SW19, said that he tried, but he couldn’t shake him. “He kept a very high gear the whole entire time without giving many real glimpses. I think that was the most defeating thing,” the Canadian said. Good for Berdych, who was pretty slow early this year, but he is getting better and better. He did reach the final here before, so maybe the Czech has a chance to upended Federer. Yes, Berdych has beaten him few times, but not a lot (18-6 for the Swiss, 1-1 at Wimbledon). So Tomas has to change a few tactics and jump on the Swiss as fast as he can. I am not shocked that Andy Murray lost, going down against the American, Sam Querrey, 3-6 6-4 6-7(4) 6-1 6-1. Look, we all knew that Murray was out of it this season. He has been OK, but not great, and clearly, his hip is very sore and he cannot run as he used to. If he can rest, and be patient, and feel 100 percent, then yes, eventually, he can win a Grand Slam again. But if he wants to play all the time, and he isn’t 100 percent because his body is a little bit messed up, then maybe he cannot win some huge events for a long time. It is up to Murray. That is a huge win by Querrey. It took him 10 years to reach a Grand Slam semi. Finally, he has improved his speed and his backhand. Plus, when he gets up to the net, he can put it away. He is a happy-go-lucky boy/man, and he smiles a lot, but tonight, he is thinking that if he can play as well as he can, he can actually reach the final. Really, he can, because of Friday he will go up against Marin Cilic, who also is playing fantastic ball. But, the former US Open champion can go way down and fast. 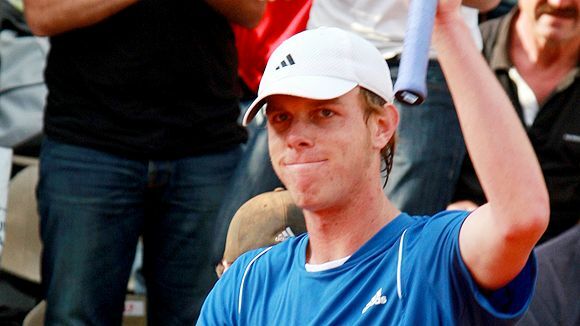 Querrey has to be patient and look for openings. Cilic is the favorite because this year, he has played smart and intelligent. With these two, it’s all about who serves into the corners, and nail forehands on the lines. It’ll be smash ball tennis.